Should I speak or should I listen? A bit about Dah: Dah’s seventh poetry collection is Something Else’s Thoughts (Transcendent Zero Press) and his poems have been published by editors from the US, UK, Ireland, Canada, Spain, Singapore, Philippines, Poland, Australia, Africa, and India. 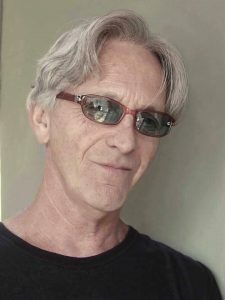 He is a Pushcart Prize and Best Of The Net nominee and the lead editor of the poetry critique group, The Lounge. Besides being a prolific writer, Dah has been a yoga practitioner since 1969, and is a certified teacher in two yogic disciplines, Shivananda and Yoga Of The Heart, and from these two schools he developed his own style, Chakra Four Yoga, which he’s been teaching to children in public and private schools since 2005. Dah stopped teaching adults in 2013, only to focus on the magical realm of teaching kids to meditate, to stretch, and to stay in harmony with the natural world. When Dah is not writing or teaching he stays close to nature and has a great passion for coastal camping along the Pacific shores and backcountry camping along lakes and rivers, as well as cycling, canoeing, and daily long walks in the redwood hills of Berkeley, California where he lives. He also spends many hours in his self-designed and self-built garden meditating or floating into a trance state of deep relaxation, dreams, and visions.